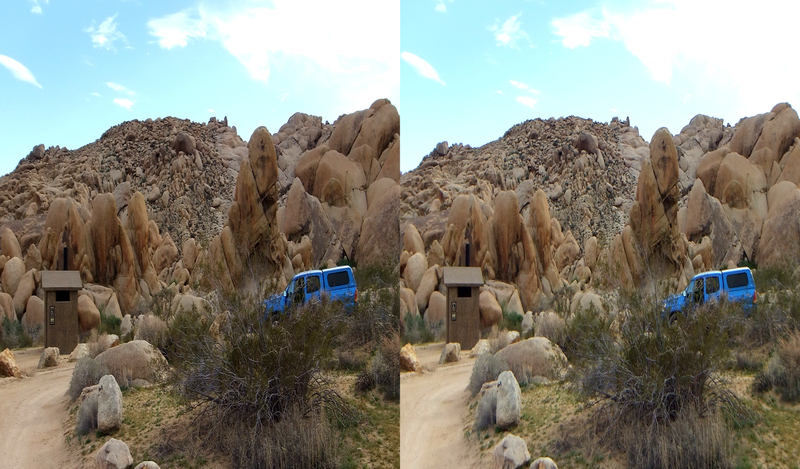 Trek Date: 2014 Mar 24. 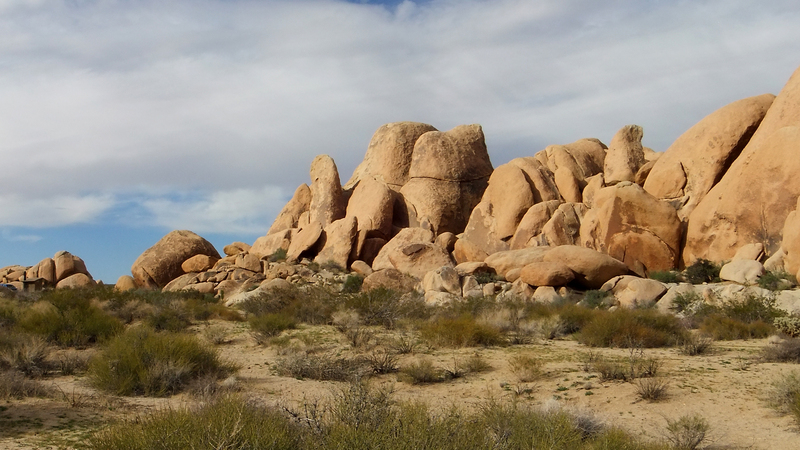 Trekkers E! 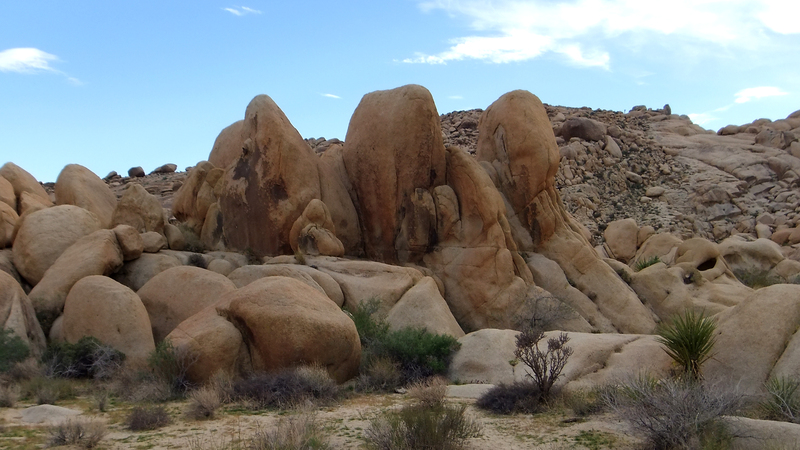 and Murbachi. 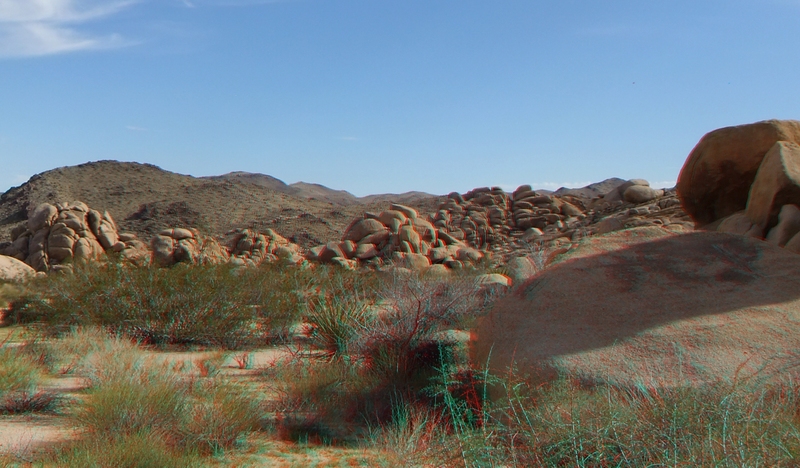 Conditions 65F with medium cirrus clouds. 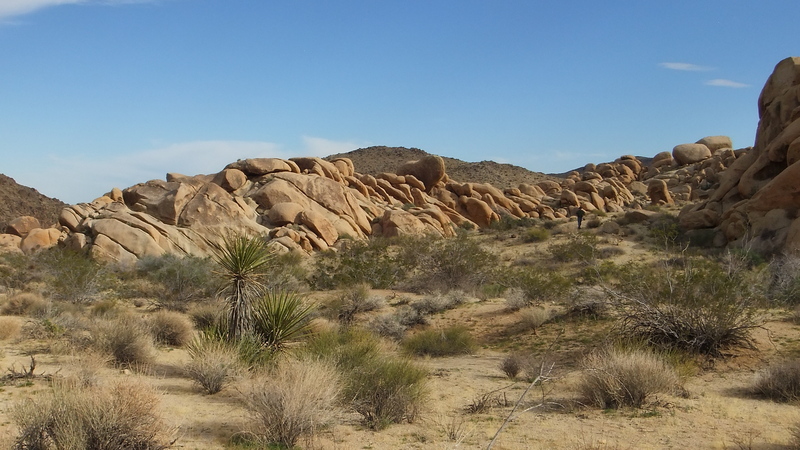 STIRRUP TANK IS OFF OF PINTO BASIN ROAD. 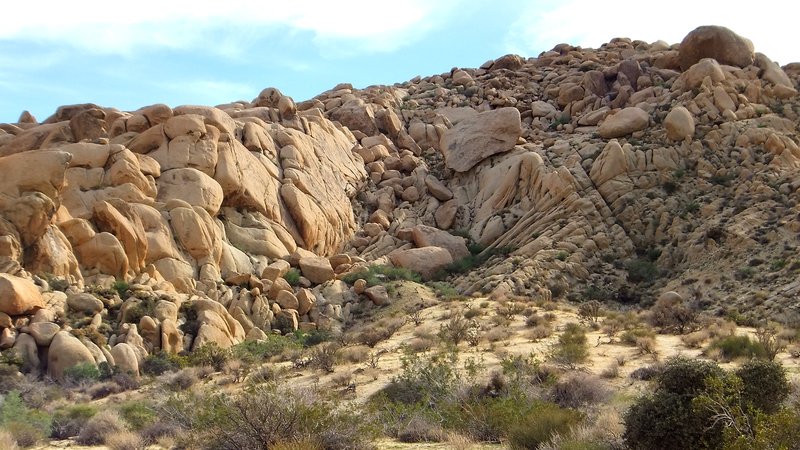 The area is easy to find. 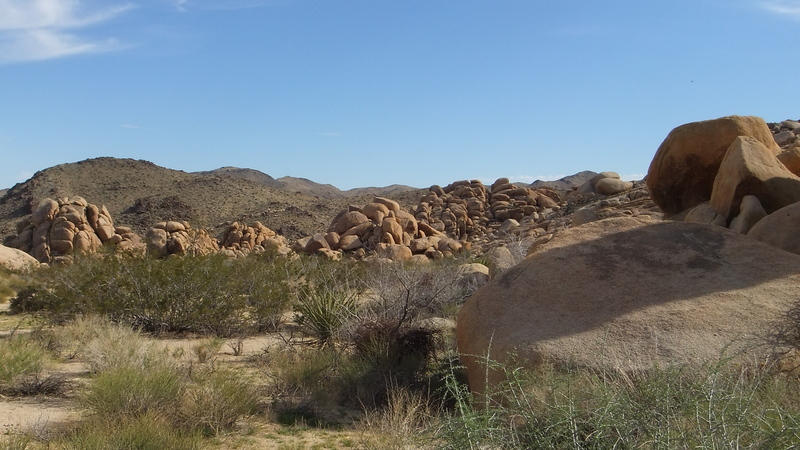 It’s accessed by a dirt road that starts about half a mile south of White Tank Campground and is on the west side of Pinto Basin Road. 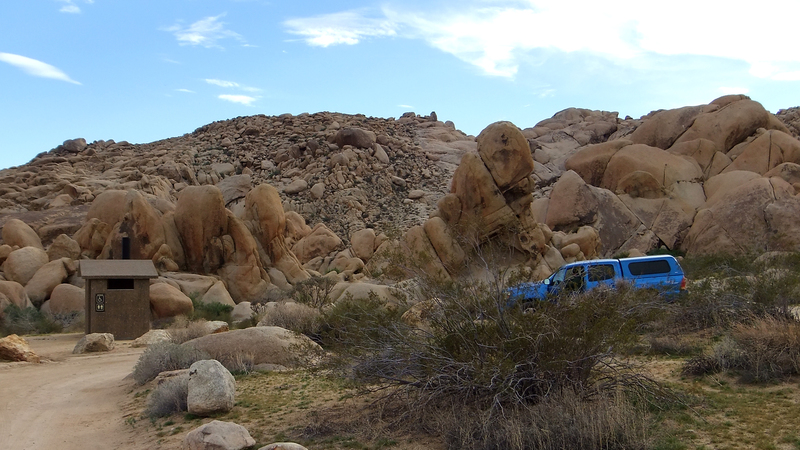 Take the dirt road 1.5 miles to a small parking loop. 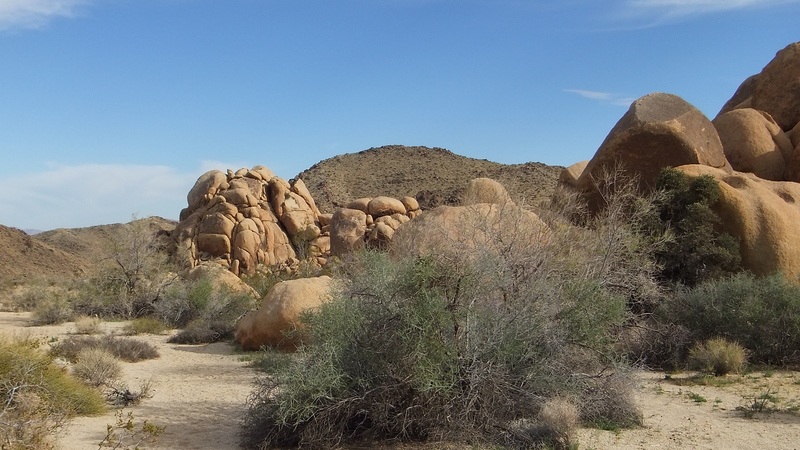 The dirt road doesn’t require a four-wheel-drive, passenger cars should do fine, unless it’s right after a period of heavy rain. 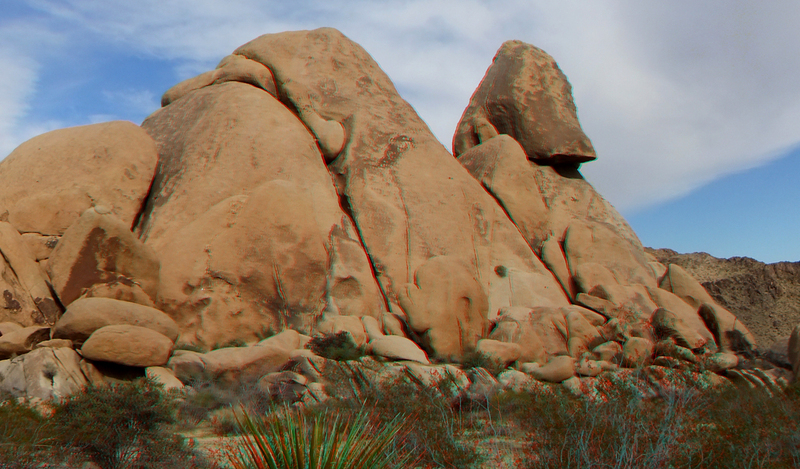 The main north-south formations known as The Stirrup Towers lie on your left as you enter the parking area. 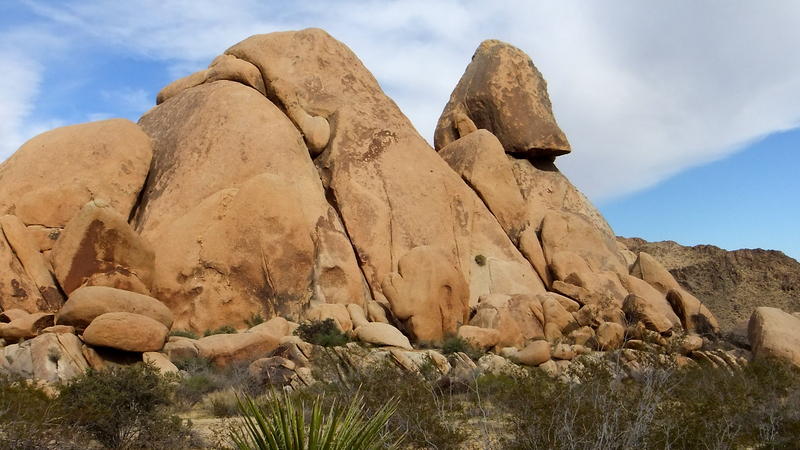 A large boulder with a wide crack on its right side greets you at the north end of The Stirrup Towers. 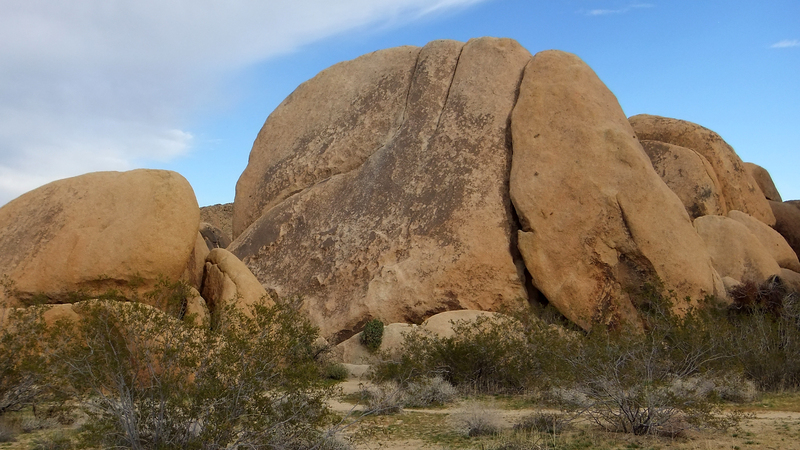 This is Wooly Spider Boulder. 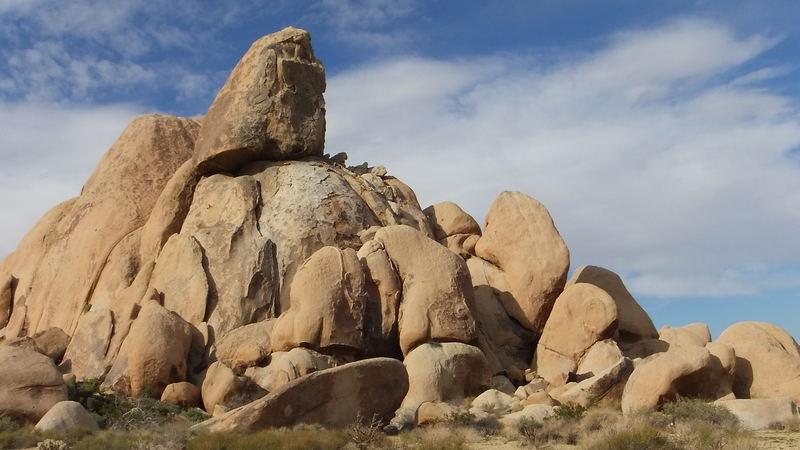 At the extreme south end is a prominent perched tower known as The Stirrup; it is the formation for which the entire Stirrup Tank area is named. 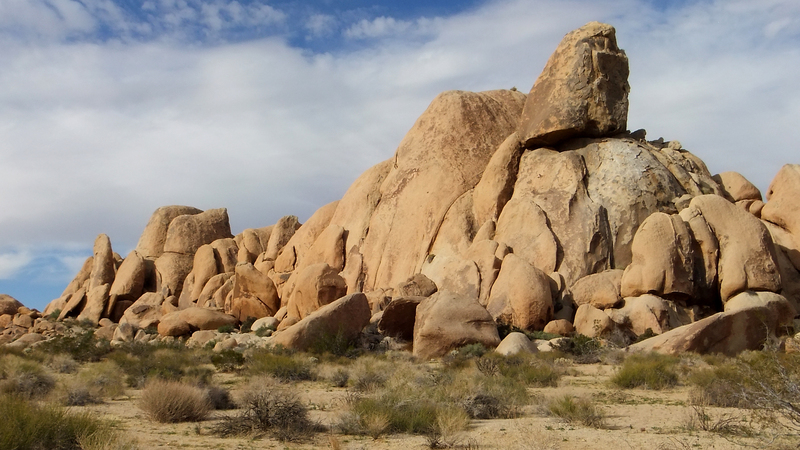 On the east side of Stirrup Towers can be found The Mental Block, while The Greystone and Zippy Rock can be found west of the parking loop. These are the right co-ordinates, now where is the Starbucks? 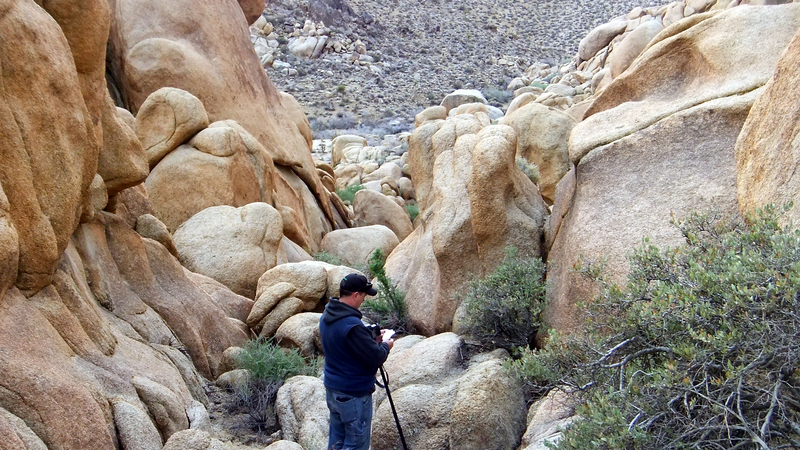 Friend Elliot Koeppel (Cali49.com) and I visited the abandoned Johns Camp mine on the morning of the 24th before heading down the road to Stirrup Tank. 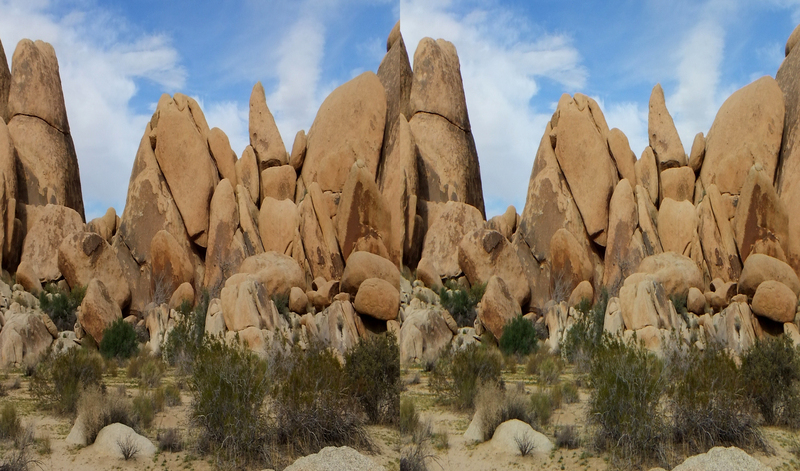 There were no rock climbers present, which pained me in a bad way since I was hoping to photograph them sticking like glue to the sides of the towers. 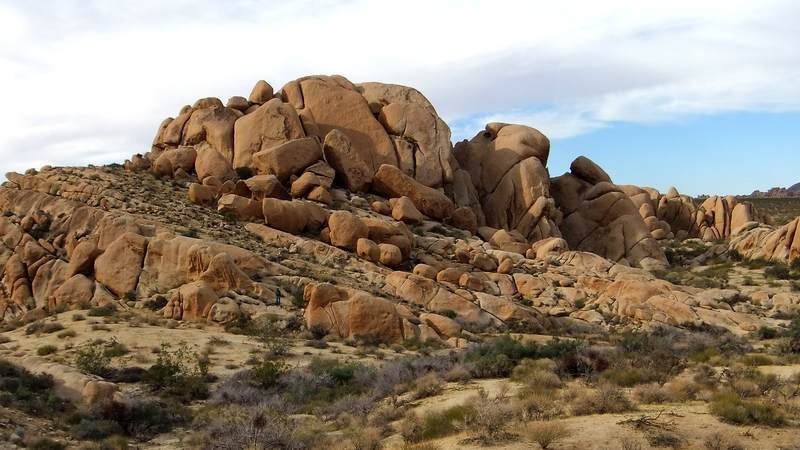 Whenever I visit the Los Angeles Zoo, I admire the denizens clinging to their cages or swinging through the trees. 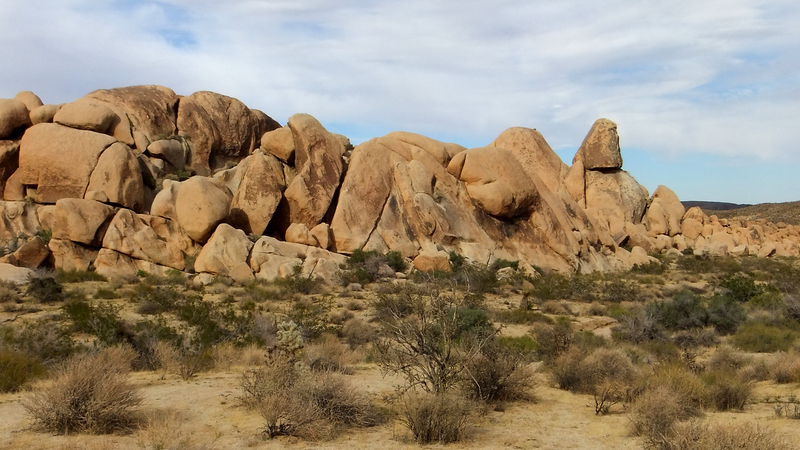 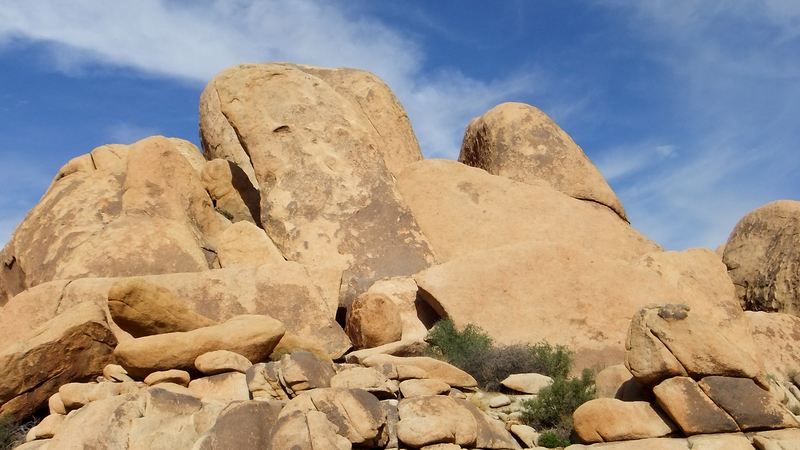 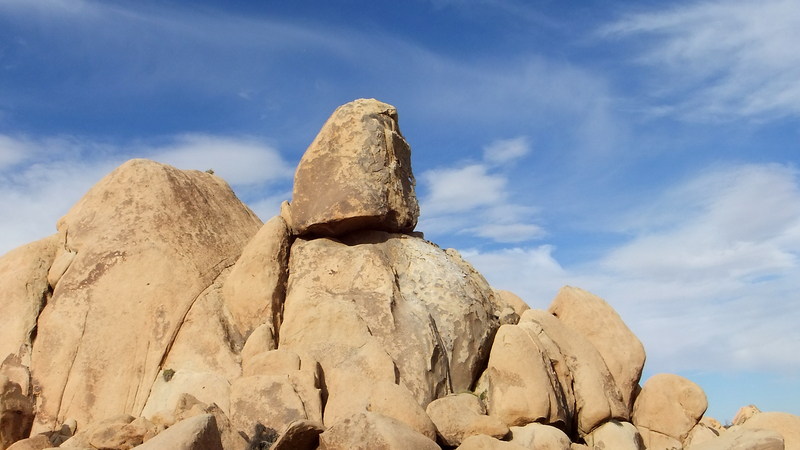 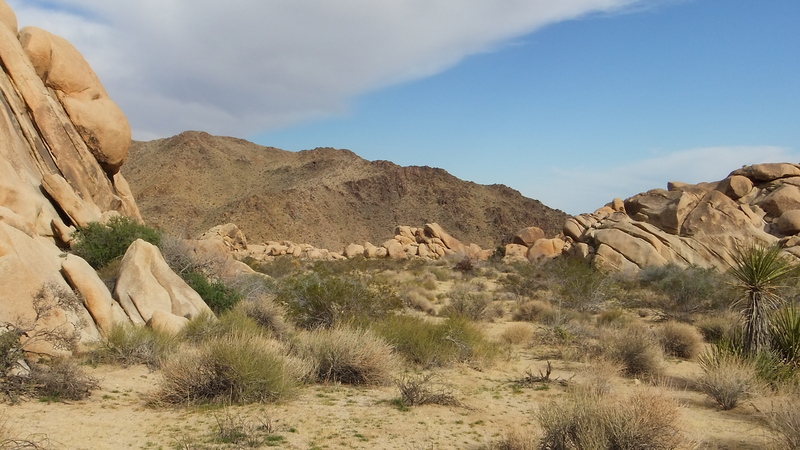 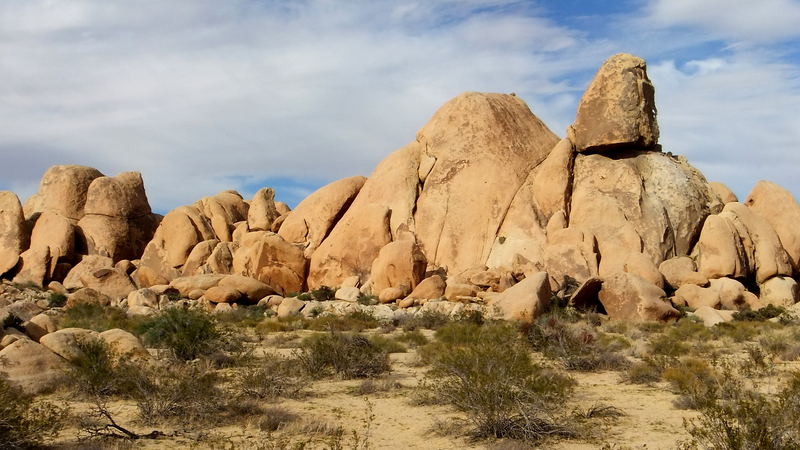 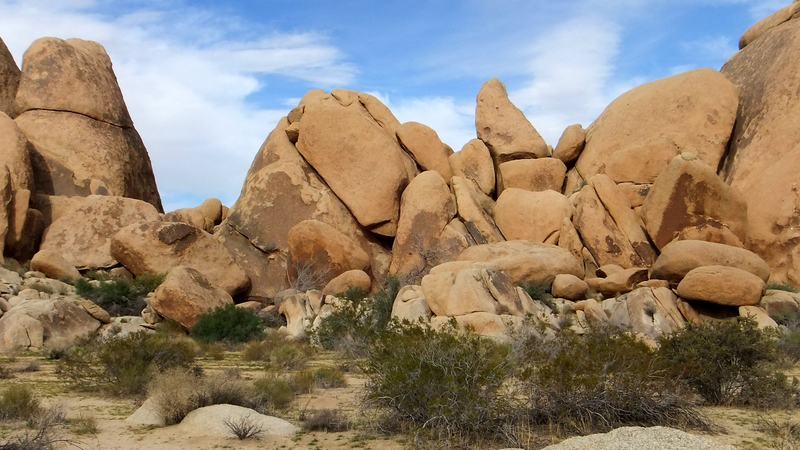 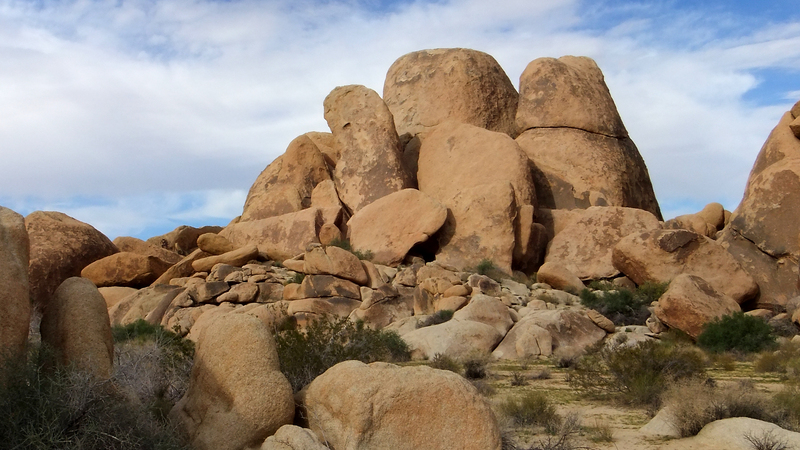 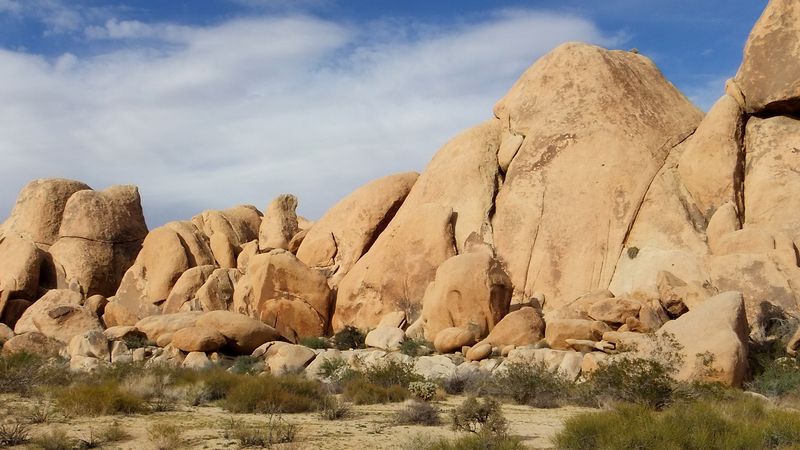 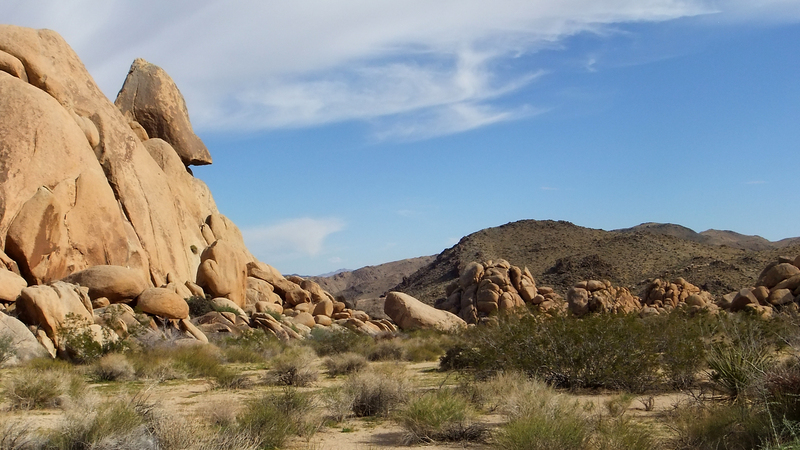 But here, out in the uncaged, yawning wild of Joshua Tree, it is more enjoyable to observe the freestylers who spend their days interacting with monoliths of granite. 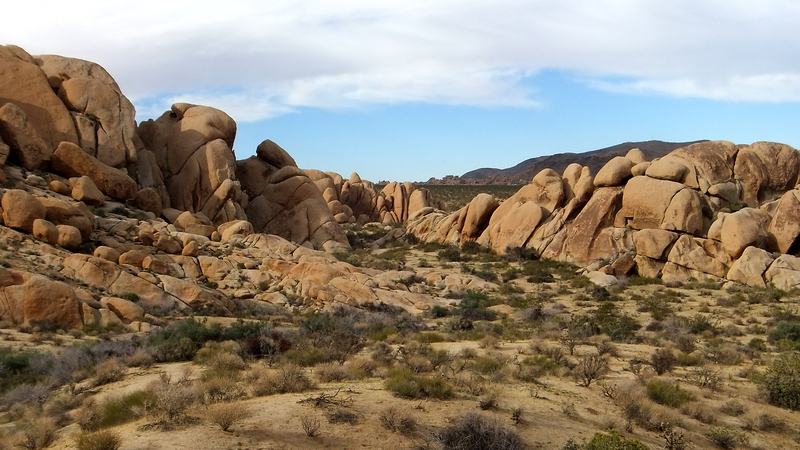 Indeed, we had the place pretty much to ourselves this trip, with only an occasional tourist party showing up. 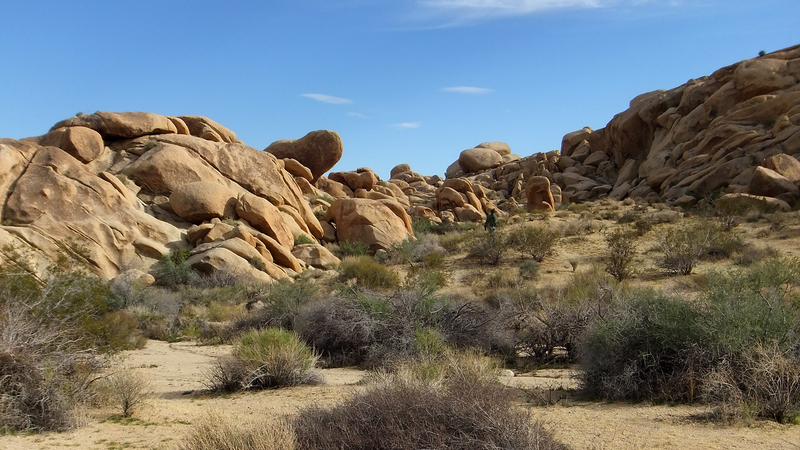 After diligent searches, we failed to locate either ‘tank’ supposedly in this area—Stirrup Tank and Hidden Tank. 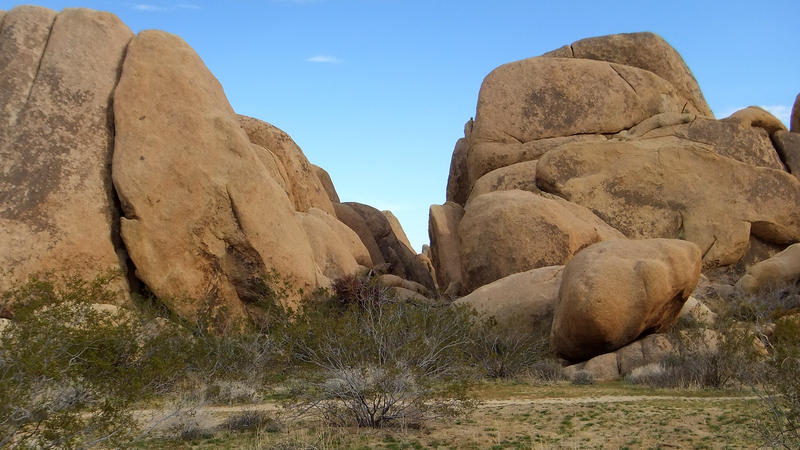 Perhaps they are tucked under rocks the way certain other small cattlemen dams are around Joshua Tree National Park. 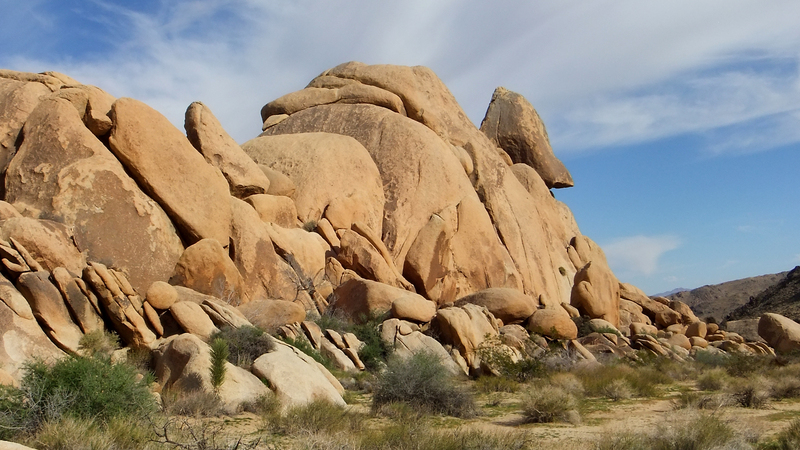 I am thinking of the ones secreted in tight nooks at Zombie Woof and Rock Garden Valley in the Lost Horse Valley region. 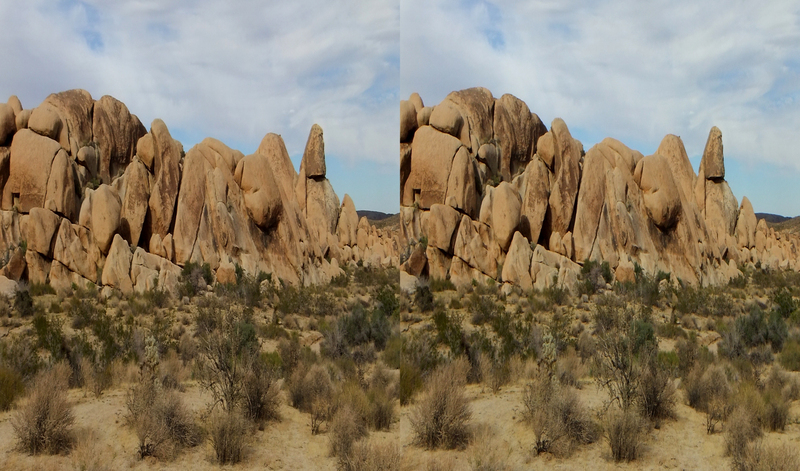 Click images to enlarge and galvanize yourselves further. 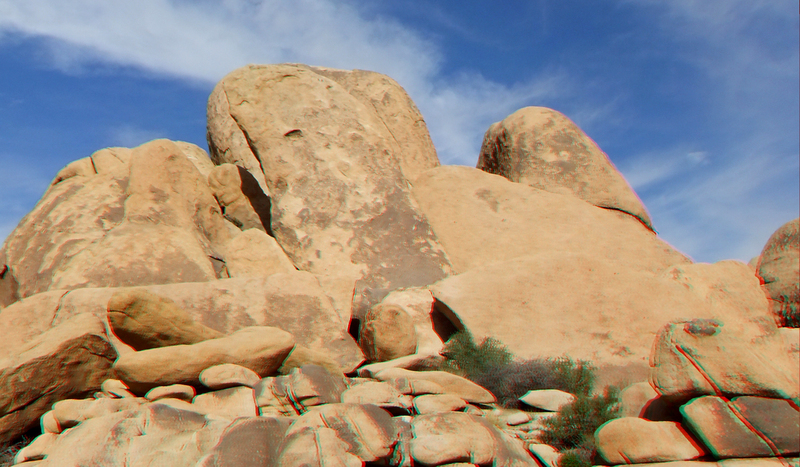 2016p resolution. 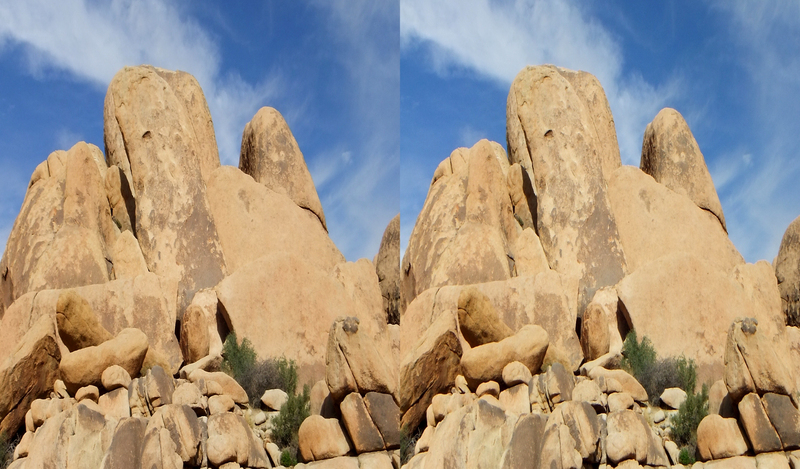 Or Windows users, right-click and choose SAVE LINK AS. 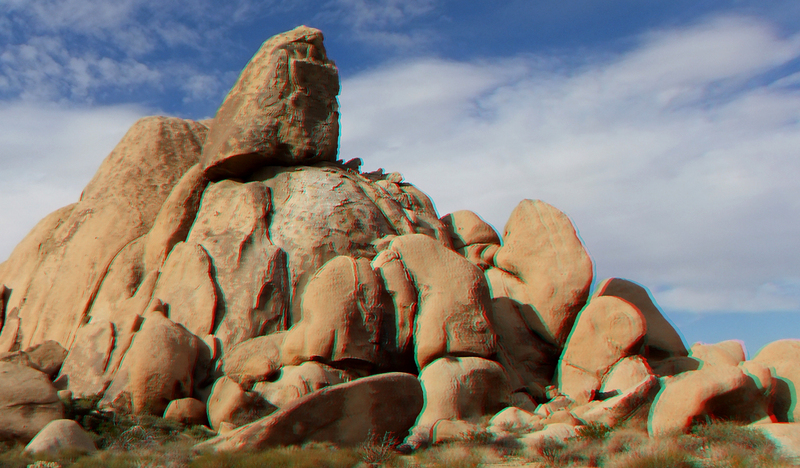 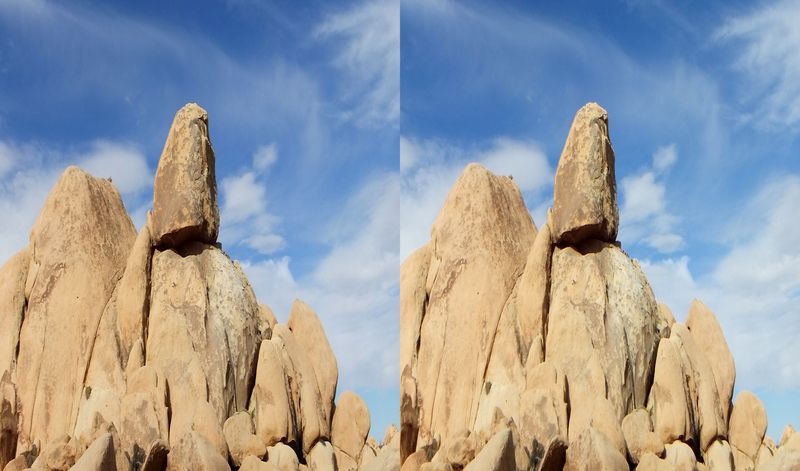 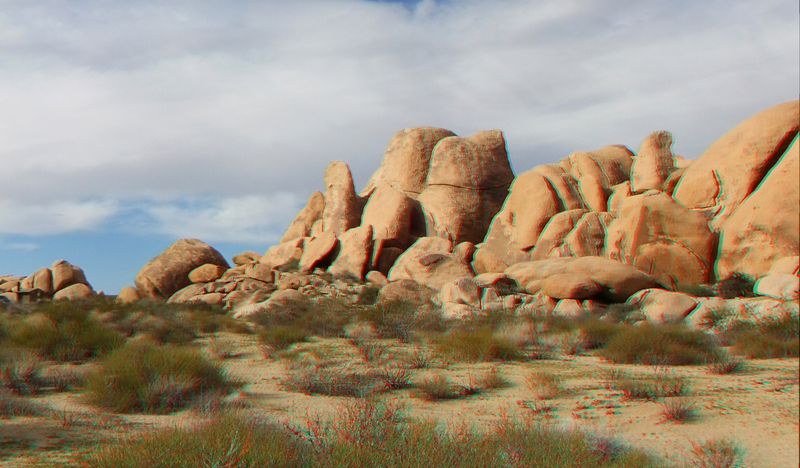 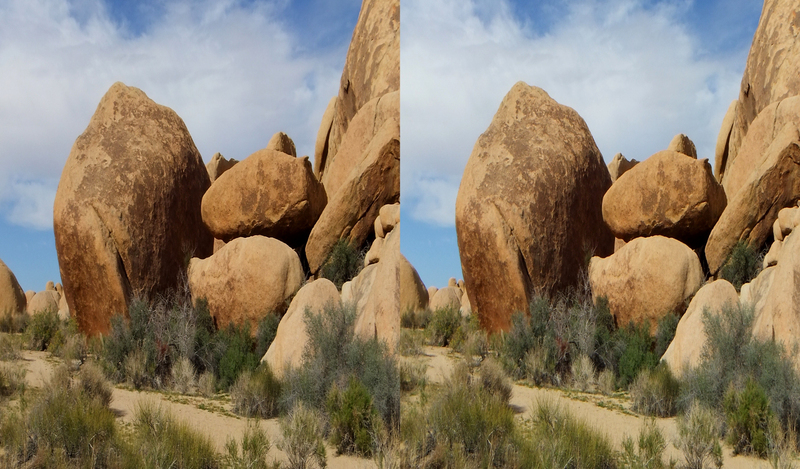 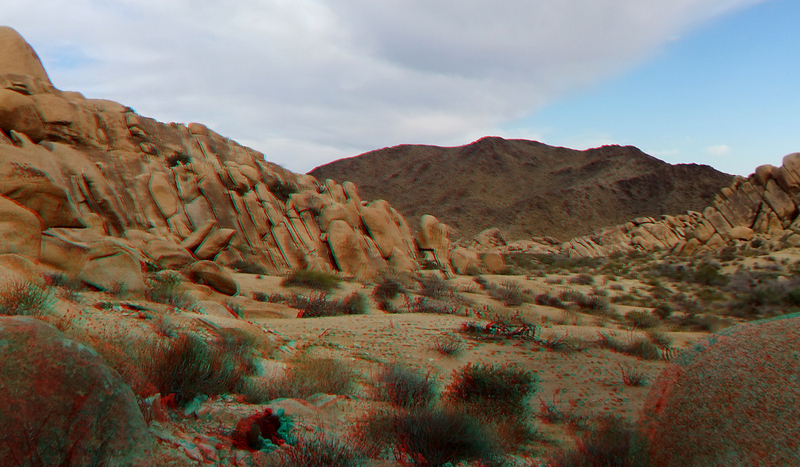 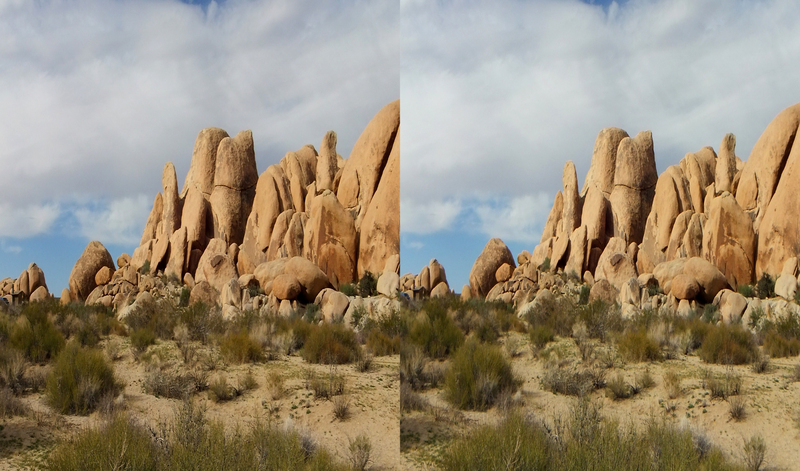 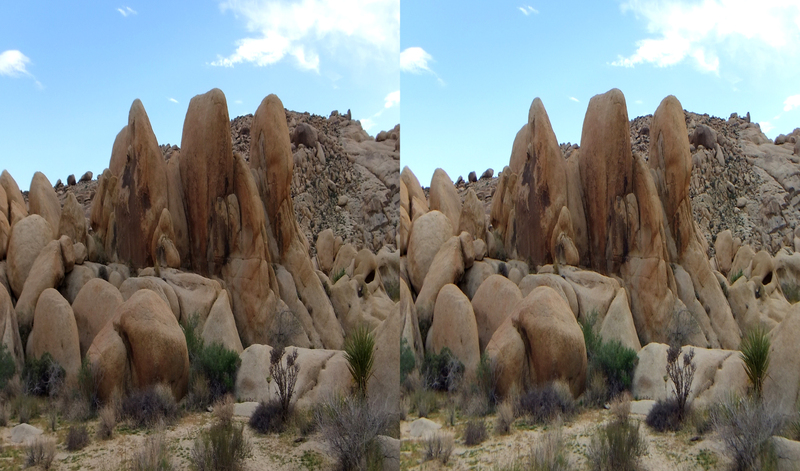 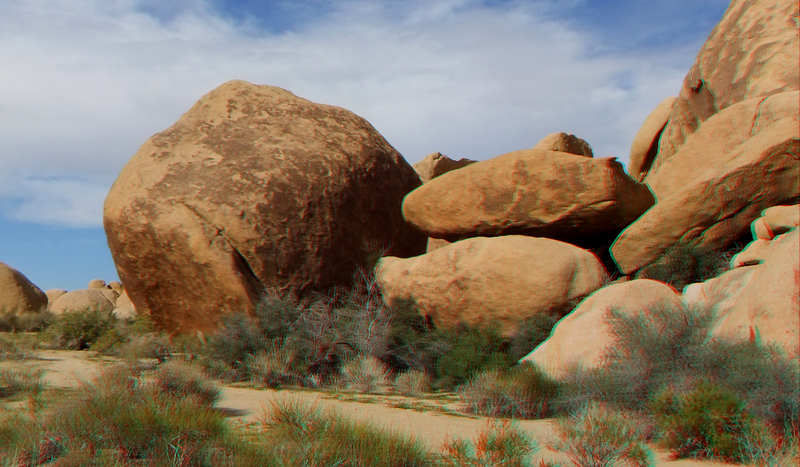 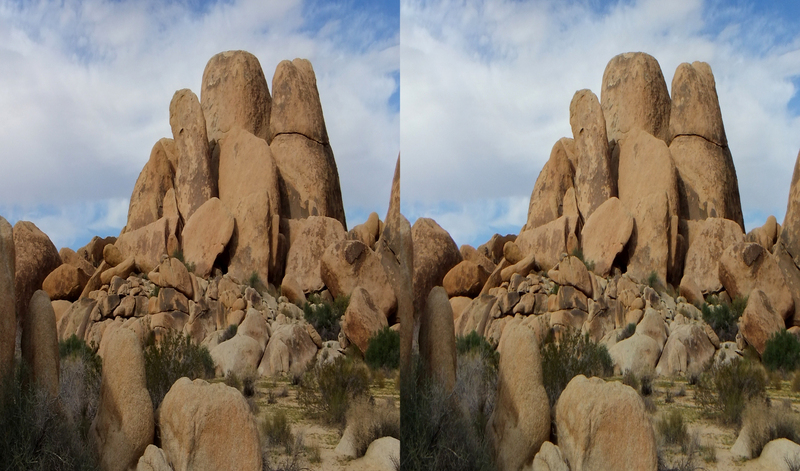 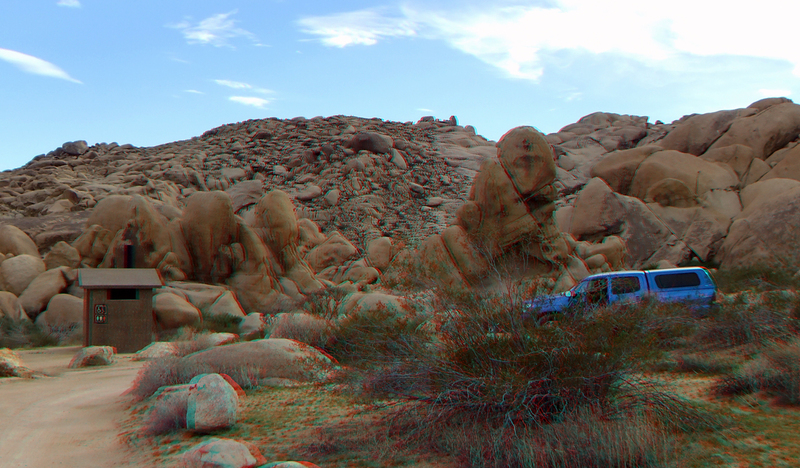 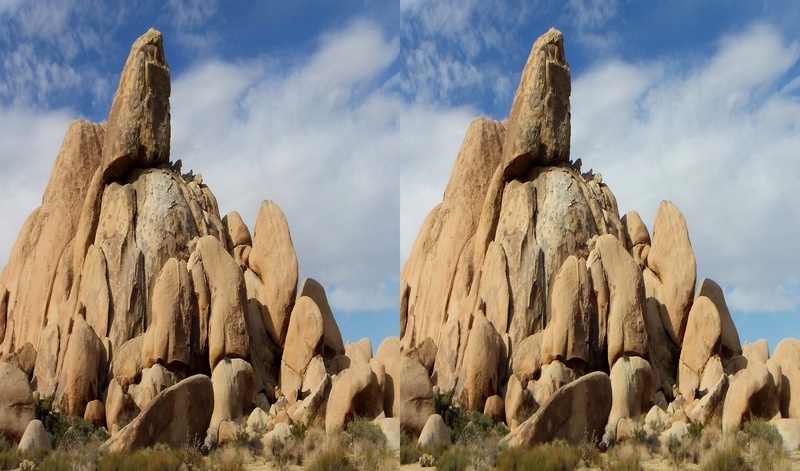 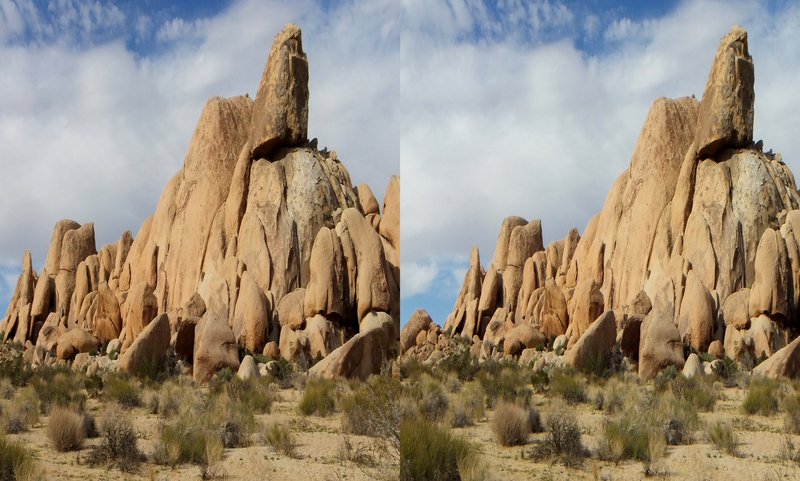 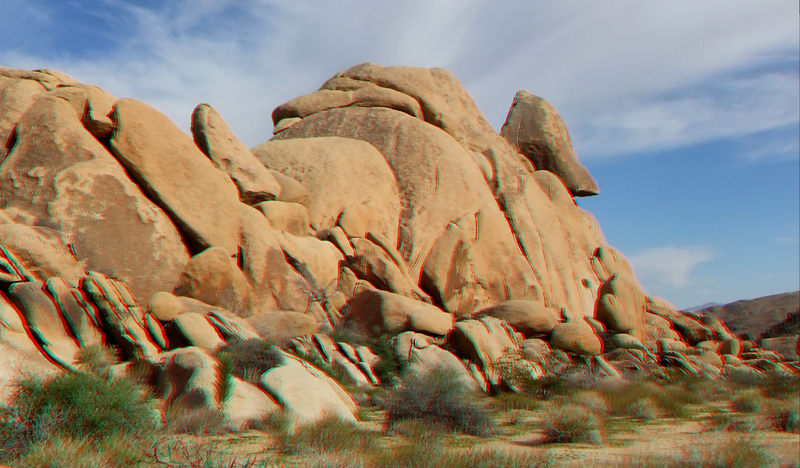 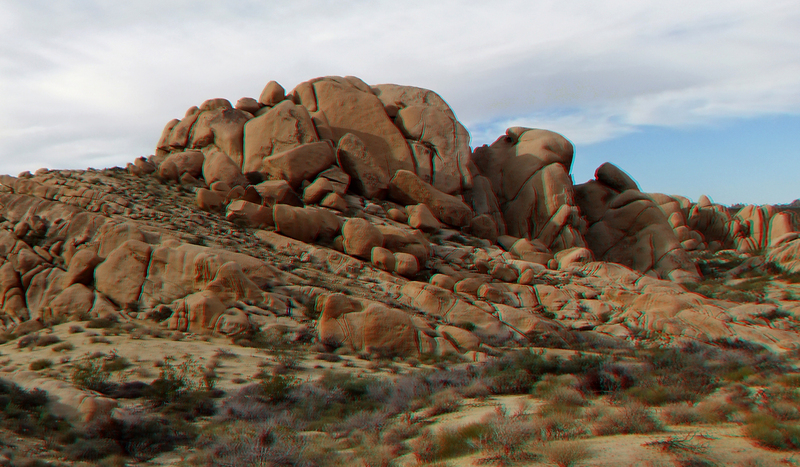 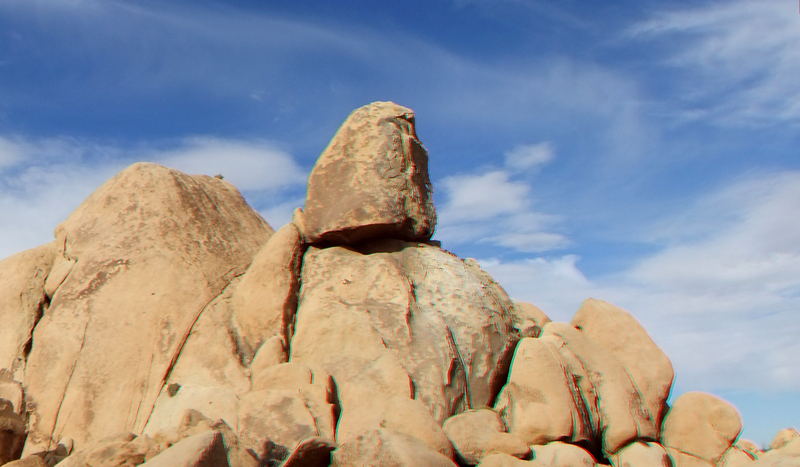 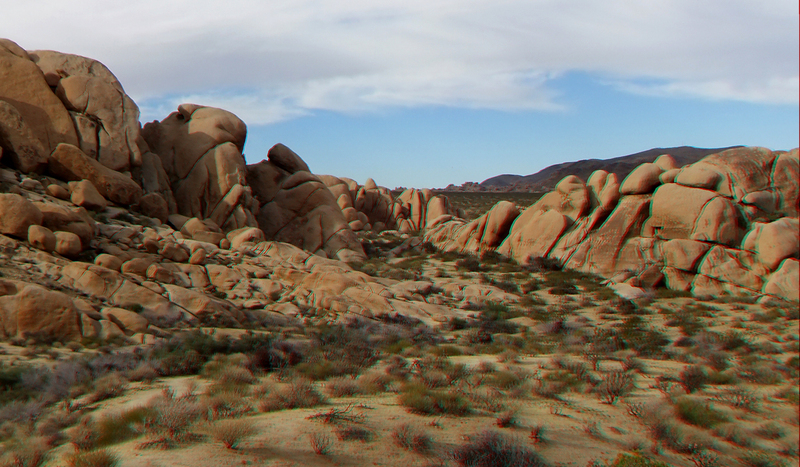 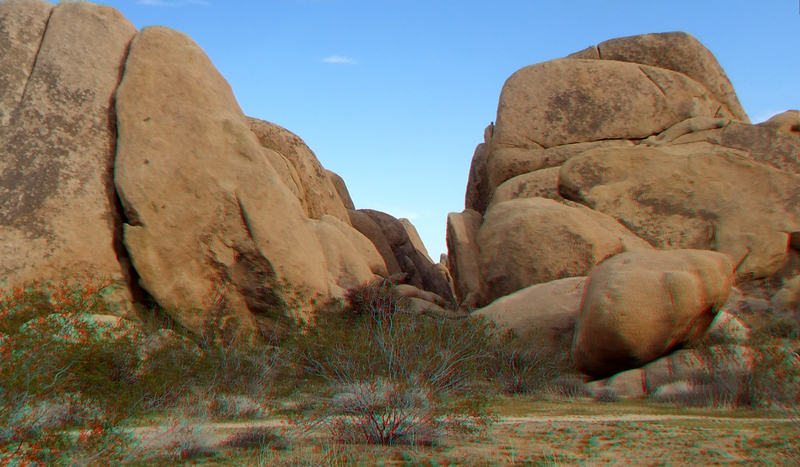 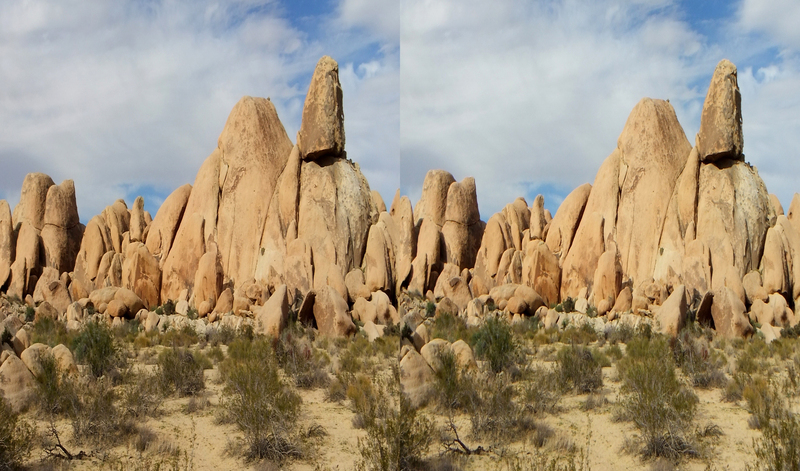 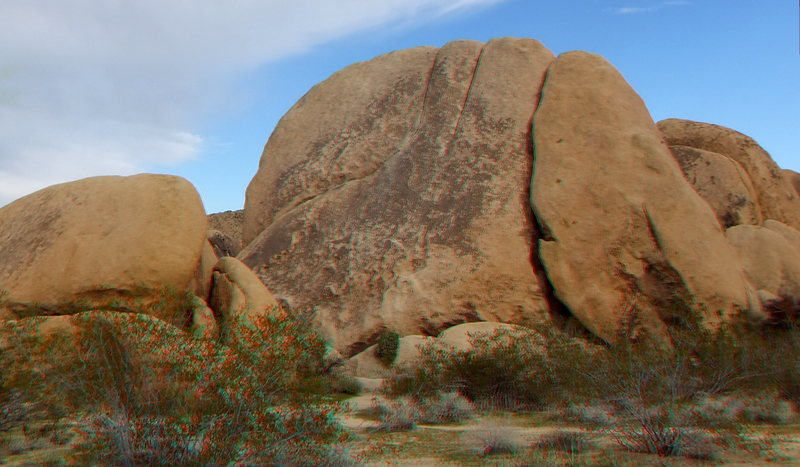 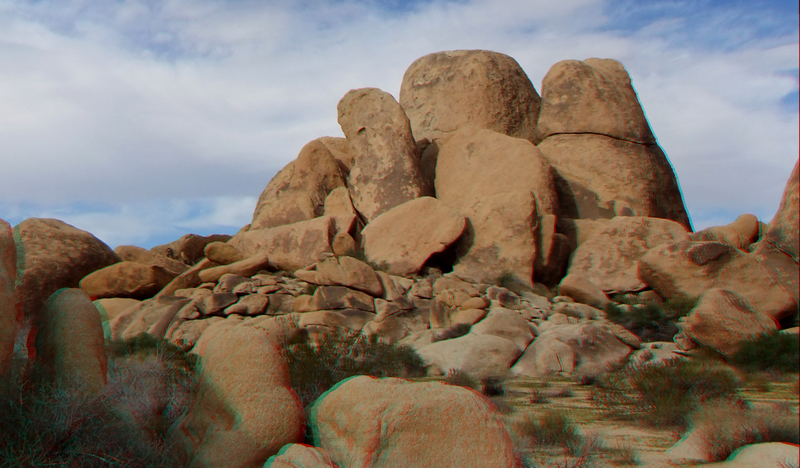 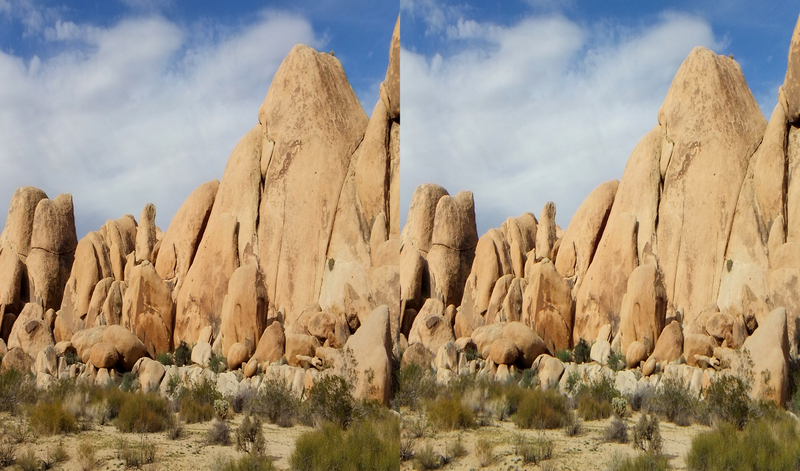 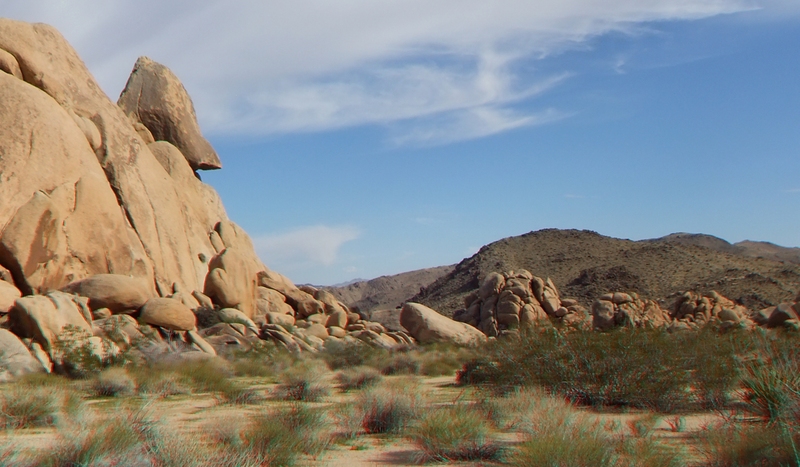 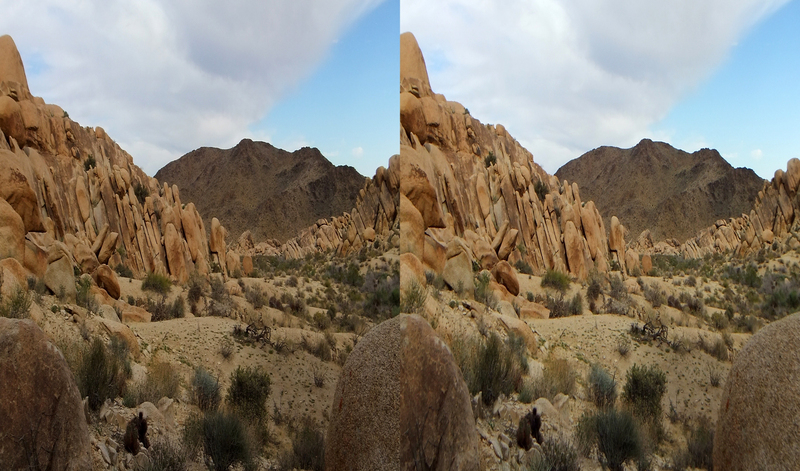 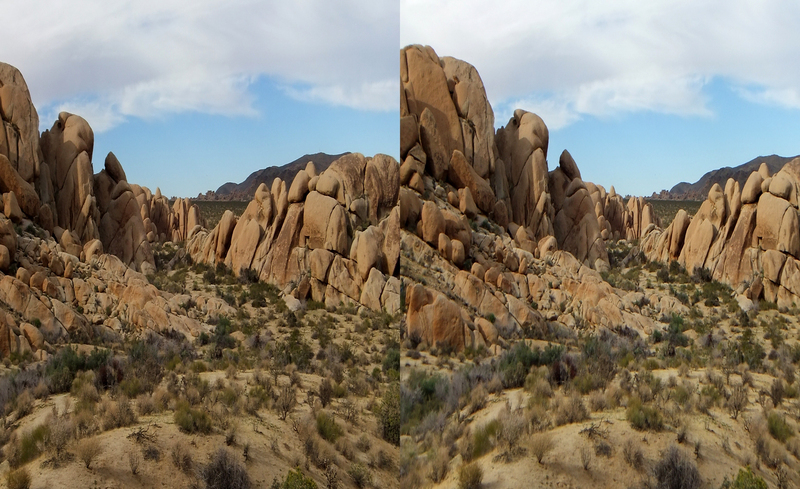 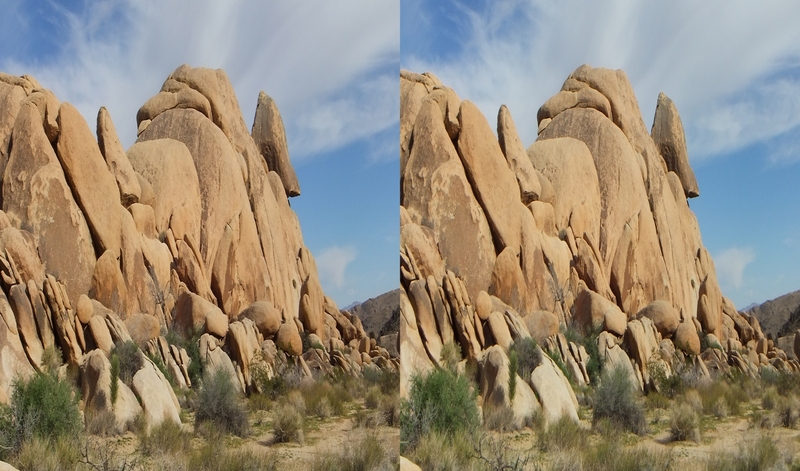 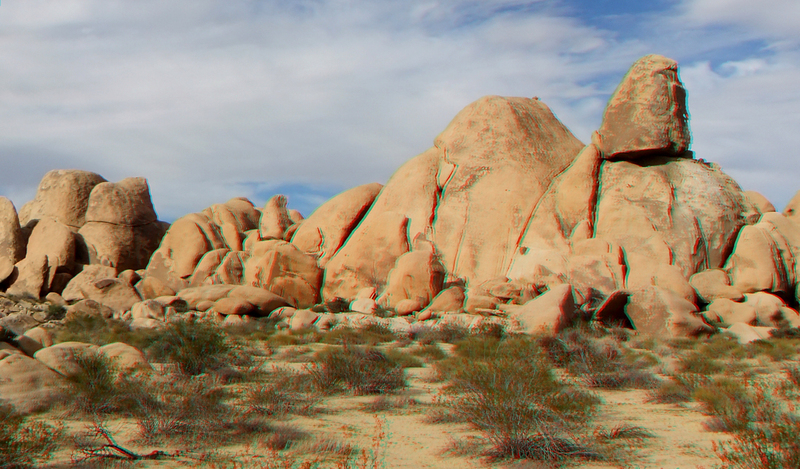 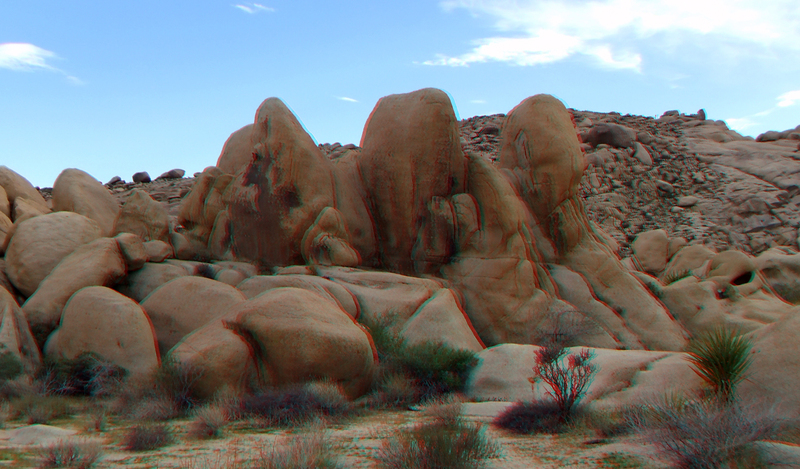 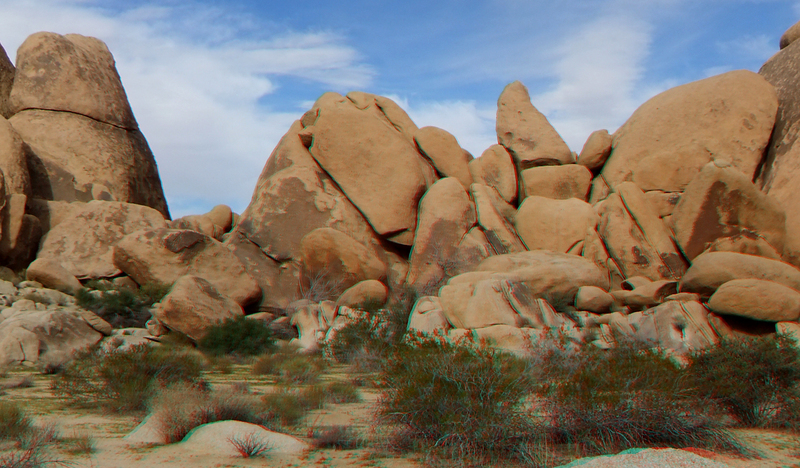 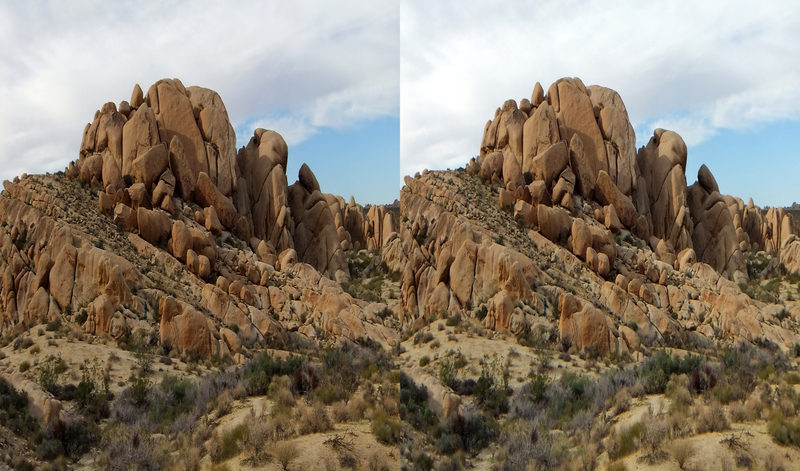 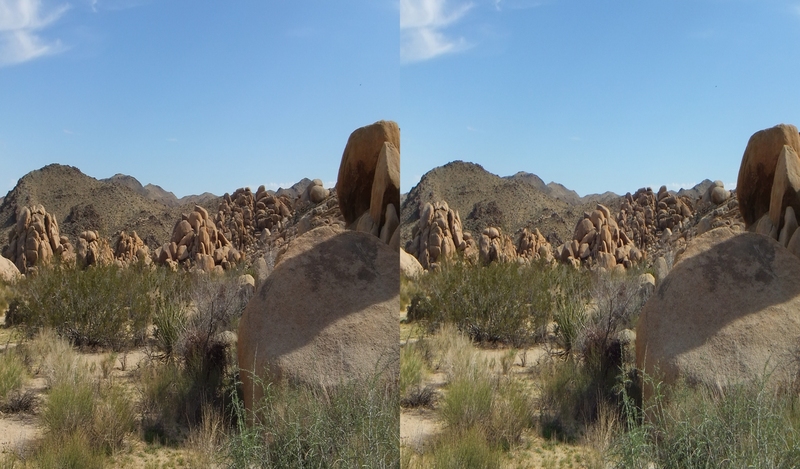 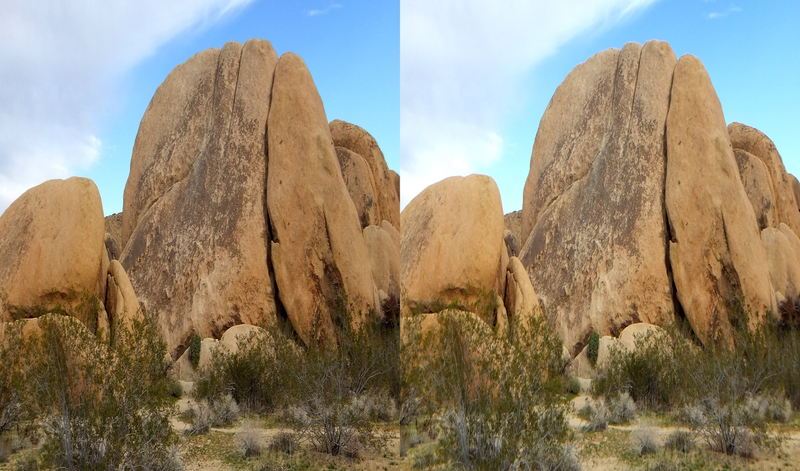 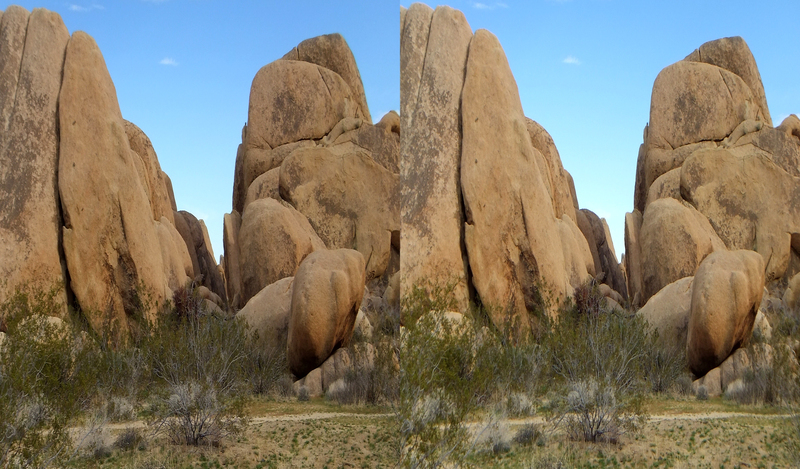 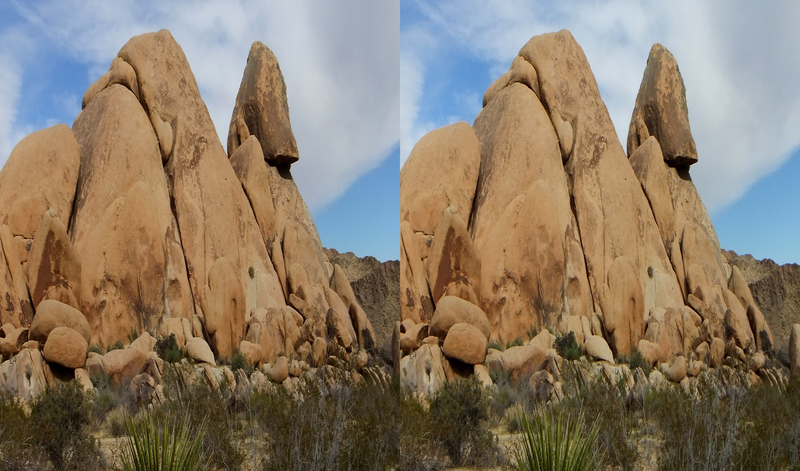 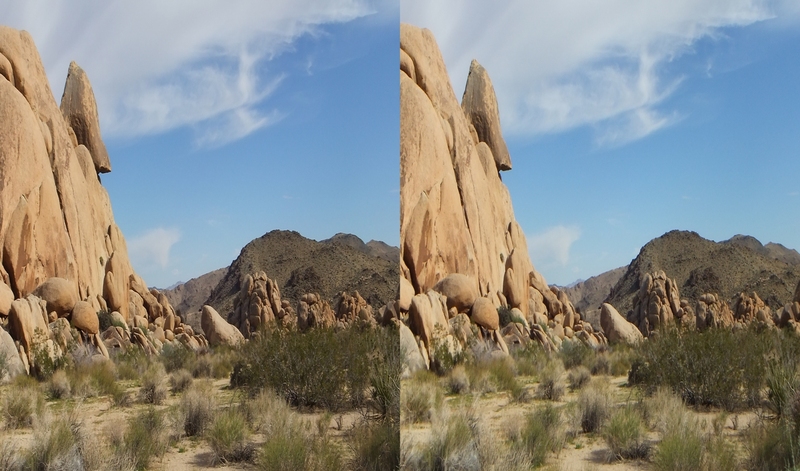 Visitors to Joshua Tree 3D are invited to download as many of the 1080p 3D Anaglyph or 3D Half Side-by-Side photographs as you wish. 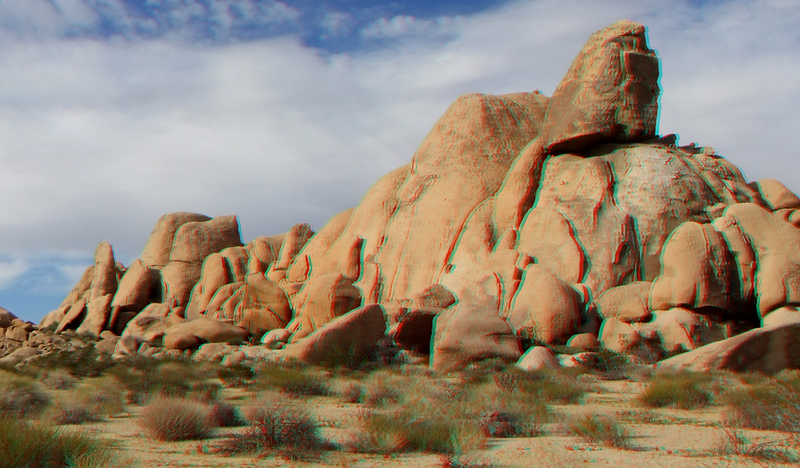 Note: 3D H-SBS images should only be saved if you have access to a 3D TV. 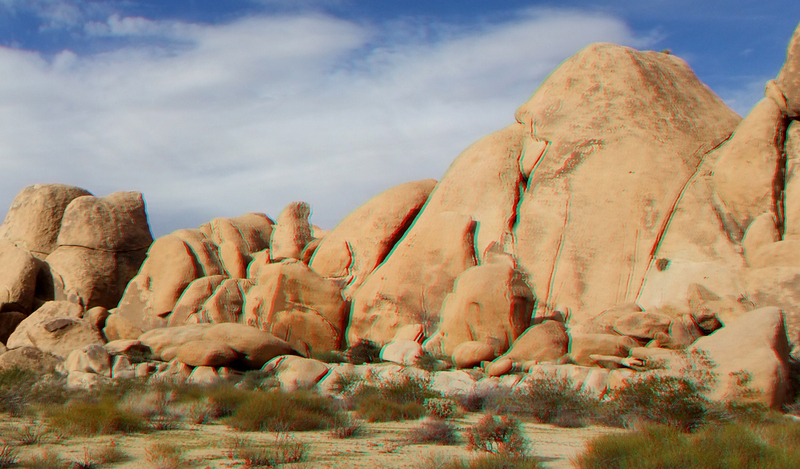 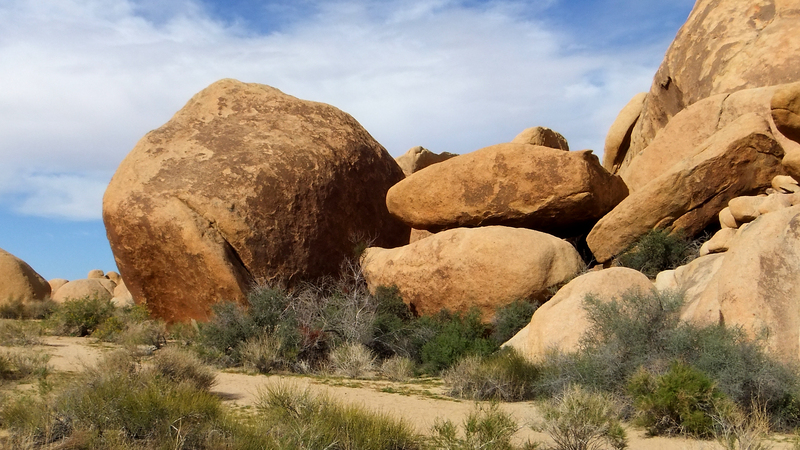 I thank you wholeheartedly for visiting Joshua Tree 3D and viewing the Stirrup Tank Gallery. 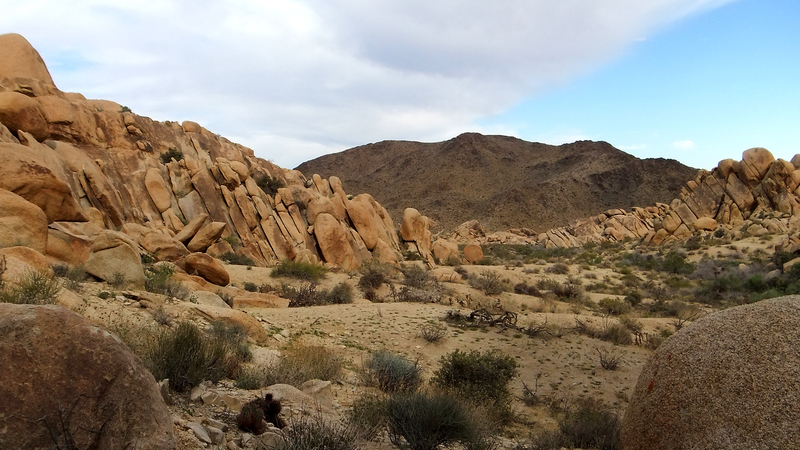 Close to White Tank campground yet a less visited region!